I feel like it’s been a while since my last post. It’s been a little crazy around my house trying to wrap up the school year for both of my boys. Last week was preschool graduation for Finn…serious stuff! And this week is the last week that Max will be a second grader. I am really looking forward to summer and all of the good food that comes with it! I love salads and plan to post as many summer salad dinners as I can. I also can’t wait for our tomatoes to finish doing their thing in our garden so I can come up with some super yummy tomato recipes. 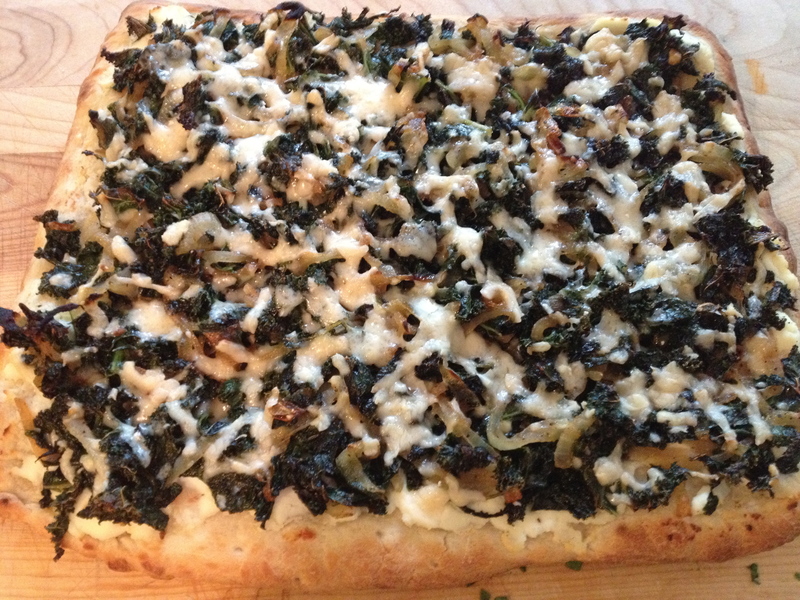 The Kale Pizza was last night’s dinner. I really wanted to post something since it had been over a week, but I really wasn’t in the mood to spend too much time in the kitchen. It all started with the left over meatballs that I had made the night before and needed to use up. 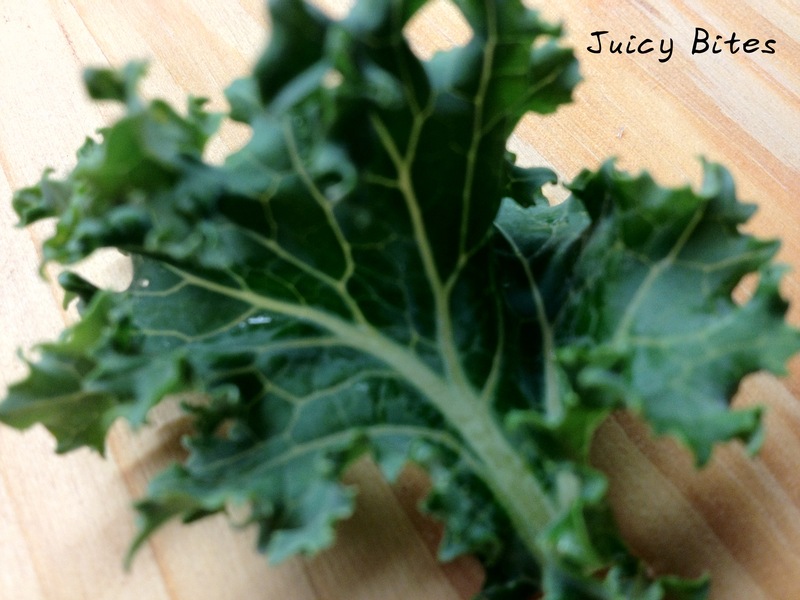 What do meatballs have to do with Kale Pizza you ask? 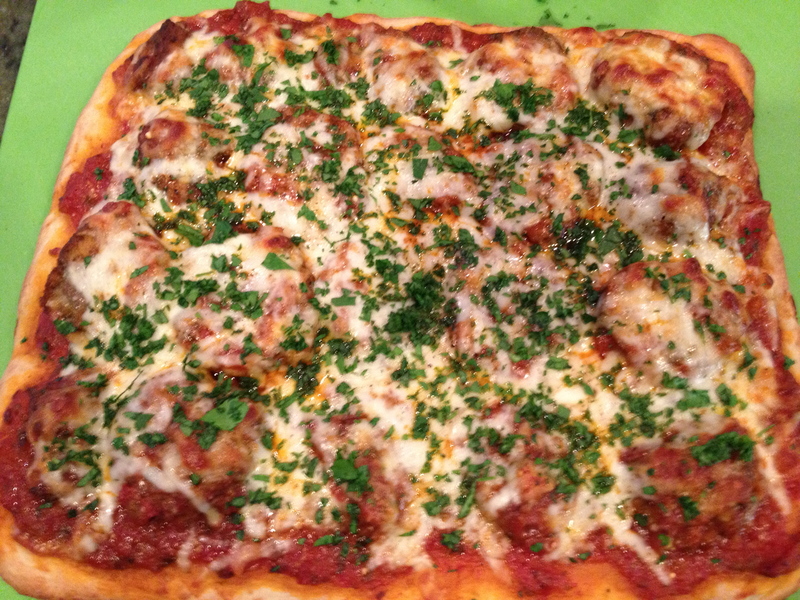 Well…I figured I would make a meatball pizza to use up the meatballs but didn’t feel like it was very blog-worthy. 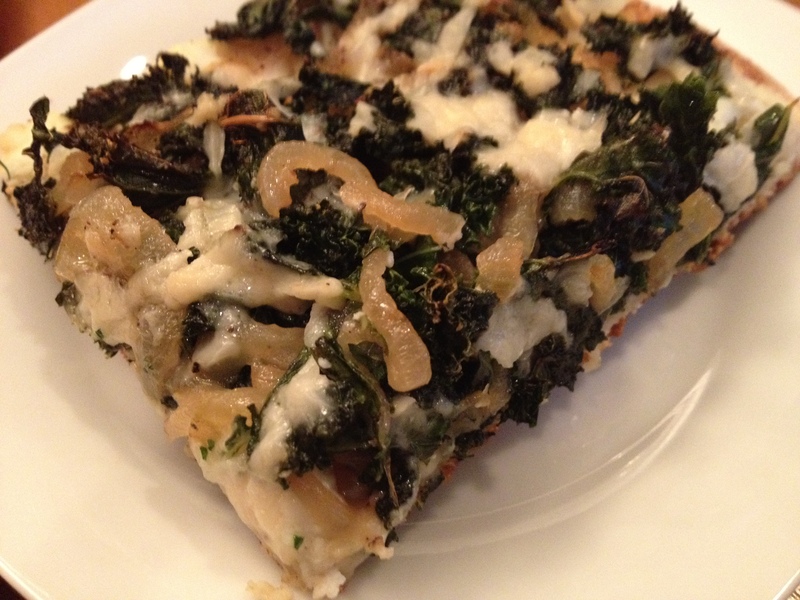 Thus was born the Kale Pizza. Something a little different, and a little healthy too. I felt like it would justify the not-so-healthy meatball pizza that we were going to be devouring. BTW…my meatballs are on my top ten list of favorite things that I make (and my family’s) and I will post them some day for sure! They are my Sicilian mother-in-law’s recipe and really good. 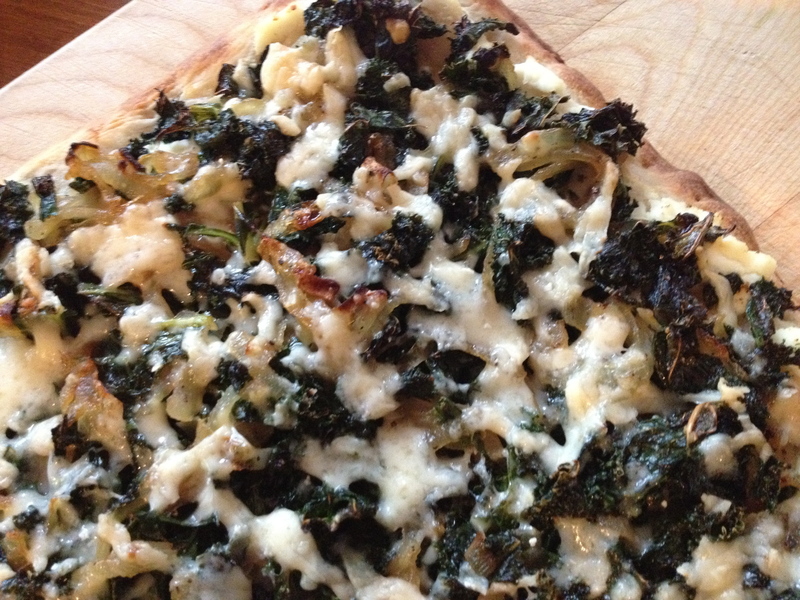 This kale pizza is really simple to make. 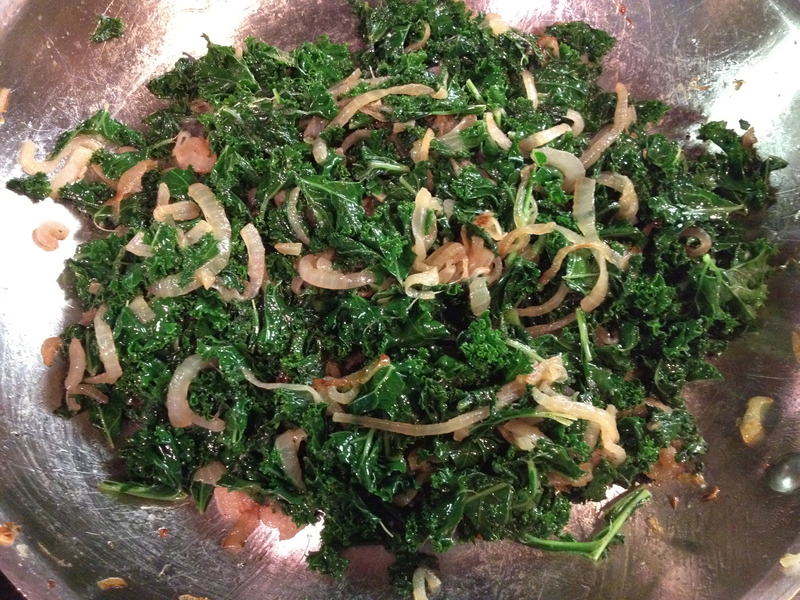 The only thing that required a little time was prepping the kale and sauteing the onions. I have seen bags of washed and trimmed kale at the market lately so you could go that route and save some time. Just make sure you get all the big pieces of the stems out because the are tough unless you cook them for a long time. 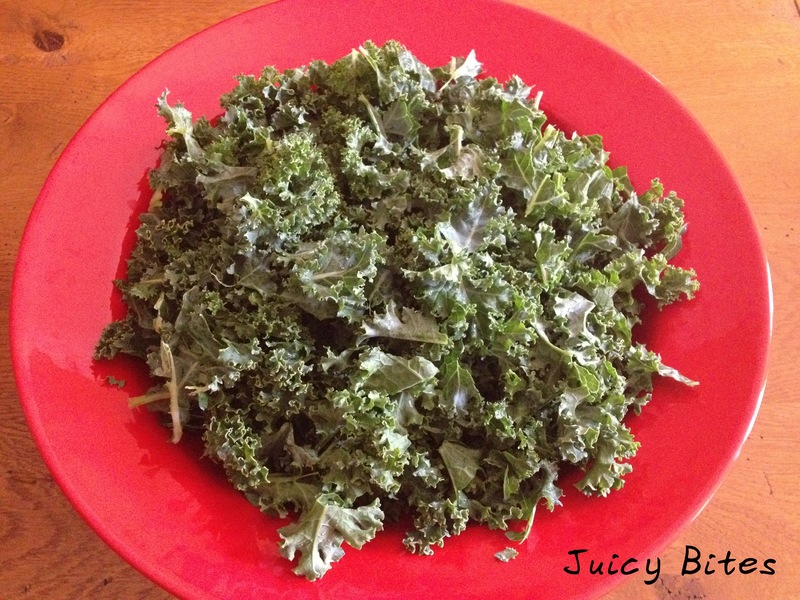 You will use what seems like a ton of kale for this, but it cooks down to a much smaller amount. All those vitamins and health benefits of the kale MUST counteract the fact that it is layered over creamy ricotta cheese and topped with more cheese…right? …to this. It takes about 20 minutes on low heat. That big bowl of kale cooked down to this. You will start by spreading some some ricotta on your pizza crust. 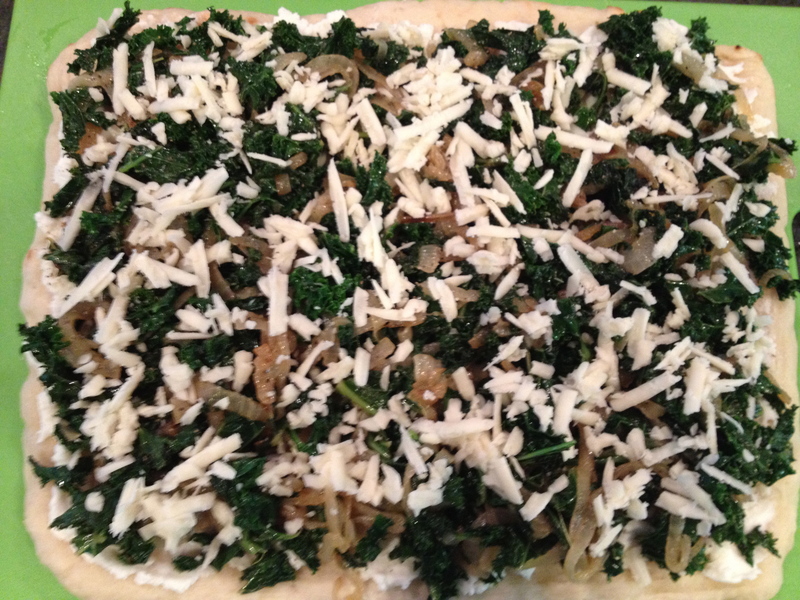 Then you top it with your kale and onion mixture and some shredded cheese. I used an aged cheddar and parmesan mix that I found at Trader Joe’s. It was really good! 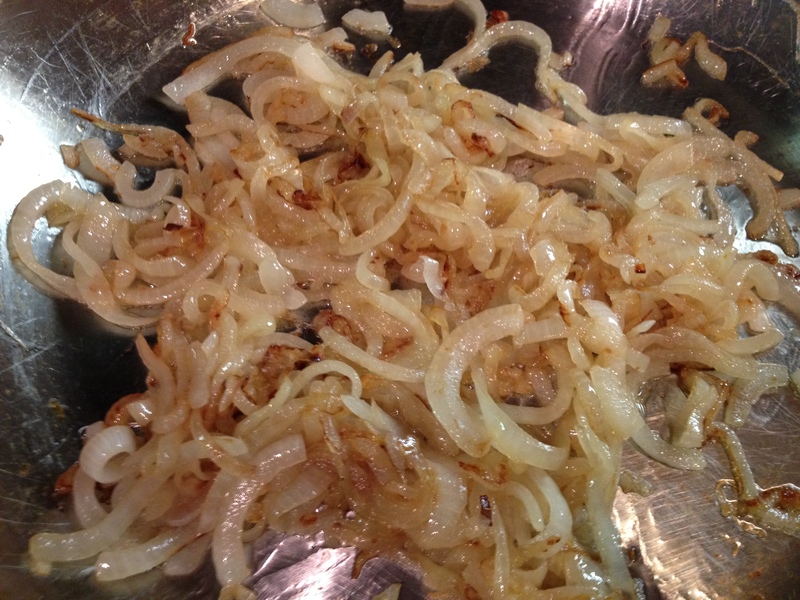 Start by sauteing your onion slices in a large frying pan with a few turns of olive oil over medium low heat. You want to cook them until they are lightly browned and very soft – about 20 minutes. Keep an eye on them and stir every so often to keep them from burning. Lower the heat if they are getting to0 brown. Once the onions are done, add the kale to the pan. 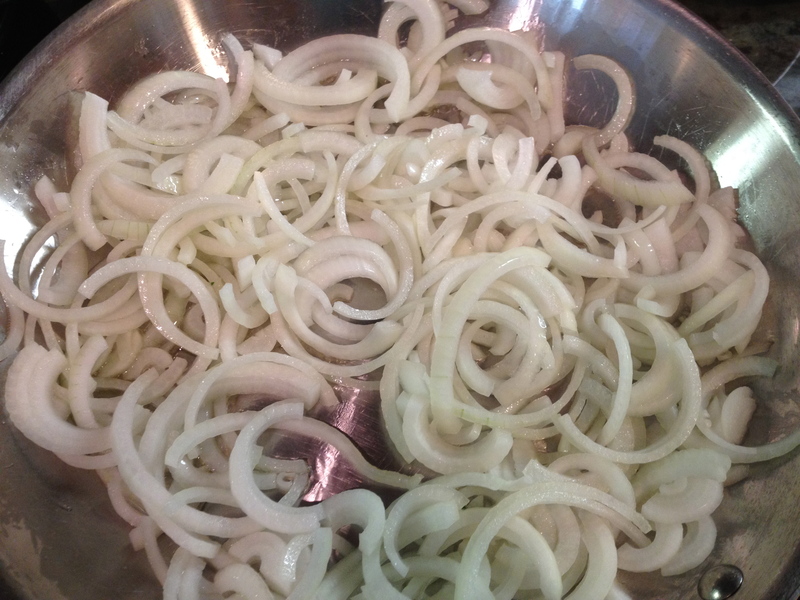 You will need to do this a few handfuls at a time and add more as it cooks down. Season well with salt and pepper to taste and cook for about 10 minutes or until it is tender. If you happen to have a splash of dry white wine lying around, you could throw it in the pan and cook for a few minutes more (I always seem to have a splash of wine lying around 🙂 but if you don’t, skip it). Remove from heat and let cool for a few minutes while you start assembling the pizza. 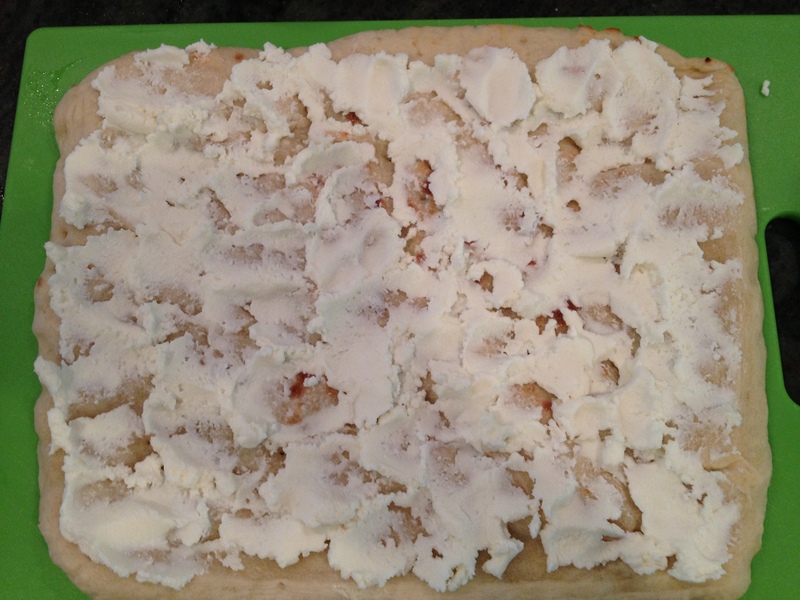 To assemble the pizza: Spread the ricotta evenly over the crust. Next layer the onion and kale mixture. Last you will add the shredded cheese. Bake the pizza directly on the oven rack (if it’s pre-baked) for about 10 to 15 minutes. When the cheese is all melted and the crust has browned a bit, you can turn on your broiler and let it brown on top for a minute or two. 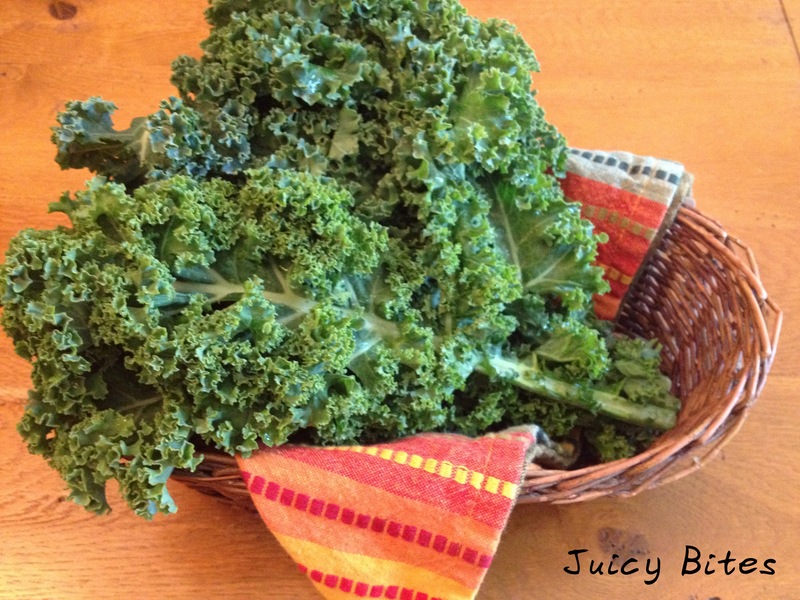 This gets the cheese nice and bubbly and crisps up a few pieces of the kale…kinda like a kale chips – so good! Let the pizza rest for a few minutes and serve. Now I know that right about now you are wondering…”But what about that meatball pizza she mentioned earlier? ?” Not to worry, I will tell you about the meatball pizza. I basically just threw my leftover meatballs and sauce on a pizza crust and covered it with shredded mozzarella cheese. It was really good!! I did slice the meatballs in thirds first because the were big. The leftover sauce made a perfect pizza sauce. I topped it with a little fresh chopped parsley. 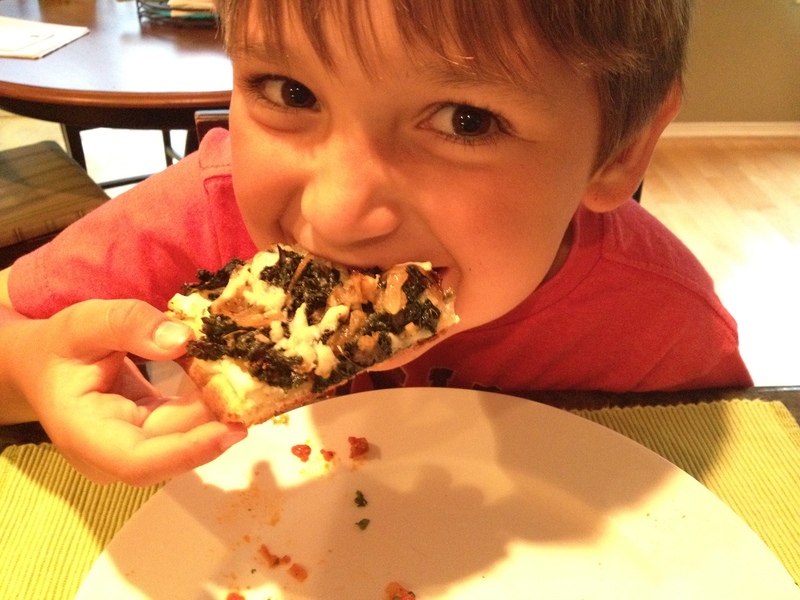 Max actually liked the Kale pizza better than the meatball pizza…and he LOVES meatballs! 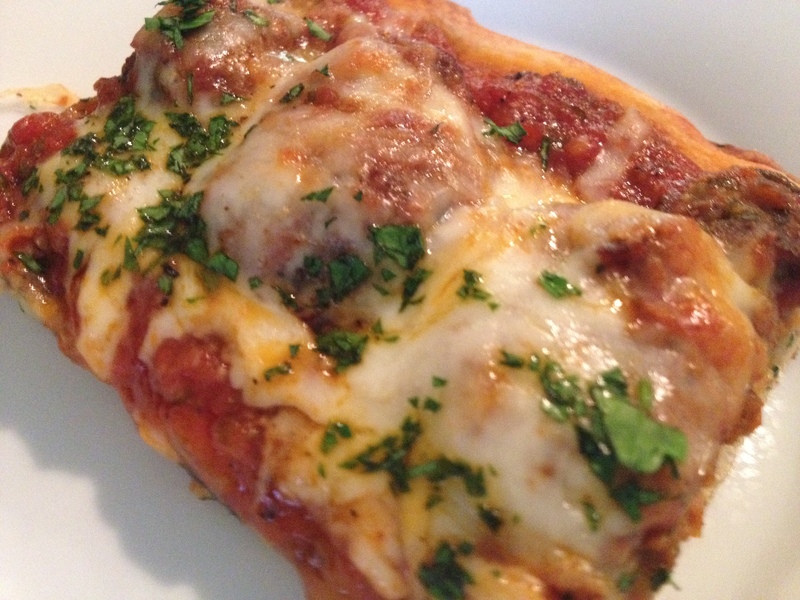 My kids loved the meatball pizza! What a great idea. 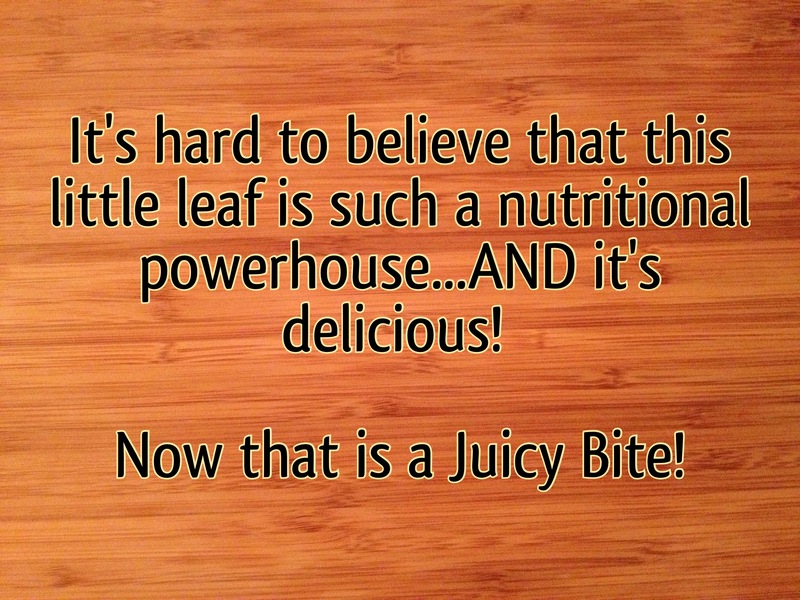 I will try the kale one next! Awesome! Glad they liked it!